Q: What exactly is a DecisionBar®? A: A DecisionBar is a specific candlestick on a candlestick chart, or a specific bar on a bar chart, that presents a natural trading opportunity. When using DecisionBars, the timing and direction of potential trades are pre-determined. All that is left for you to do is evaluate the risk and determine if you wish to take the trade. DecisionBars are so powerful that even if you took every trade offered, you would make a profit on most stocks with reasonable volatility. Q: What can I trade with DecisionBar®? A: You can trade any liquid security: stocks, options, ETFs, futures (commodities), or currencies (Forex). If you have a question about a specific security, send an email to support@DecisionBar.com. You will receive a reply within 24 hours. Q: Can DecisionBar® be used for swing-trading as well as day-trading? How about position trading? A: Of course!! The principles of supply and demand hold for all time frames and all markets as long as there is enough volume to create a true market. Q: Must I use a certain charting platform to use DecisionBar® Trading Software? A: Yes. DecisionBar® Trading Software works on EIGHT superior charting platforms including eSignal, MultiCharts, TradeStation, NinjaTrader MetaTrader, MCFX, MetaStock and our newest addition, a web based version of DecisionBar powered by TradingView.com..
Click here for more information on compatible charting platforms..
Q: What if I'm using a charting platform that isn't currently compatible with DecisionBar Trading Software? 3: If options 1 and 2 don't work for you, there is still no need to give up your current broker or charting platform, however you will have to add a charting platform compatible with DecisionBar. Click Here for more information on charting platforms. * Remember, there is no need to give up your current charting platform and there is no need to change brokers. Q: How much does it cost to become a DecisionBar® member? A: Membership cost LESS than your daily beverage at Starbucks! I know it’s hard to believe but, while competing software packages can cost thousands of dollars, your Membership to DecisionBar costs only $99 today and $99 every other month. That works out to only $49.50/month – about $1.65 per day! And that price is guaranteed. As long as you remain a Member your subscription fee will never increase. Plus, if you don’t like recurring bi-monthly charges, when you go to our order form you’ll see you can choose from annual payment which will save you even more money, or a Lifetime Membership with even greater savings. And no matter which payment option you choose, as long as you are a member you also receive all upgrades and enhancements (including new DecisionBar modules) at no additional charge. Don’t let the low price fool you. 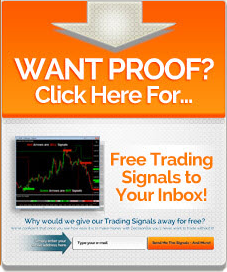 We challenge you to find a better trading method and software, at any price. Q: How does your software compare with that "Red Light, Green Light" software? A: Well, of course, we think our software is superior. The software you're referring to is a trend following system. It uses red and green lights and some kind of momentum chart to tell you when to trade. The DecisionBar® software, on the other hand, is multi-faceted. It looks for trends, breakouts, and reversals and costs much less. 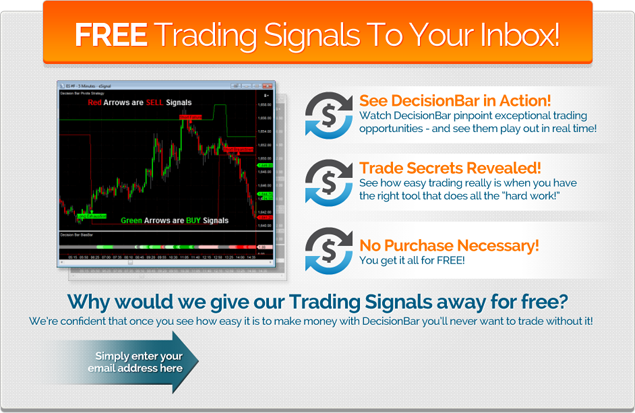 DecisionBar trading signals are unambiguous and posted in real time. Once a signal is posted on the chart, it stays on the chart. Also, once you buy the "Red Light, Green Light" software, you really need to subscribe to their market scanning service, which costs more than our entire software package, just to find stocks which might fit their trading criteria. When you use the DecisionBar Software, every stock fits our trading criteria. Just pick the stock you want to trade and our software will tell you when to Buy and when to Sell, when to take a long position and when to take a short position. Q: You state that someone can be trading profitably within two hours of receiving the DecisionBar Trading Kit. How can that be when other trading courses take months and cost thousands of dollars? A: First of all, two hours is a best case scenario. is certainly possible because a) you can read the entire training manual in about 2 hours and b) DecisionBar is designed to do the “hard” work. But smart traders will take their time, trade on paper for a while, make certain they understand the DecisionBar trading methods, and can show a paper profit before they trade. That being said, we stand by that statement. The DecisionBar trading method is intuitive and the software is very easy to use. The manual is clearly written and down to earth. The tutorials give you real-life trading examples, and, if you look at our screen shots, you'll see how our DecisionBar Strategy Indicator gives you a "feel" for the rhythm of the market, as well as unambiguous buy and sell signals. Q: Will you tell me when and what you are trading? A: No. The beauty of the DecisionBar® Trading Method is it works for any trading instrument in any time frame. Once you become a DecisionBar trader, you won't care what we are trading. You'll be able to make your own trading decisions with confidence. With DecisionBar you can identify many excellent profit opportunity trades we’re not even looking for or involved in. Why would you want to limit yourself? Plus, there are traders out there who use their information to manipulate the markets through their subscribers! We find that 100% unethical (and may even be illegal in certain circumstances) and we’ll have no part of that! Q: Will I be able to immediately download DecisionBar® Trading Software after activating my membership? A: No, DecisionBar® is not available for instant download. I realize that may disappoint you, but our first goal is your success. Most people skim things online. It is very important that you read and thoroughly understand the DecisionBar Trading Manual before you start trading. That's why I send you a physical package--so you will take time to read the material carefully. You will receive your Trading Kit, which includes the DecisionBar Trading Software, the DecisionBar Trading Manual, and Quick Starts for the various platforms DecisionBar runs on, within 48 to 72 hours. It’s our goal to have you up and trading profitably within 24 hours of receiving your package. The first thing you should do when you receive your Trading Kit is shut off your computer. Then find a quiet place where you can devote an hour or two to reading the DecisionBar Trading Manual. It’s a little over 100 pages long. It includes a number of charts showing DecisionBar in action, so it makes for easy reading. The information the manual contains is priceless. After you read it, you will have a better understanding of the forces working on the financial markets than 98% of all traders. When you complete the manual, you should install the DecisionBar® indicators and work through the quick-start for your charting platform. Then you can paper trade until you are comfortable with the DecisionBar method and are showing a consistent profit. Q: What exactly will I receive when I activate my DecisionBar® membership? A: You will receive a complete Trading Kit, sent via priority mail (usually two to three day delivery). The kit includes the DecisionBar Trading Software, the DecisionBar Trading Manual, and Quick Starts for the various platforms DecisionBar runs on. You will also receive a direct link to our live online support system, so you can log on with one of our technicians anytime you have a problem or wish to take advantage of our one-on-one training. Q: Can I install DecisionBar® on two computers--one at work and one at home? A: Yes, you can install DecisionBar® on two computers, but you will only be able to use the program on one computer at a time--unless you've purchased multiple memberships. Q: What kind of computer system do I need to run your software?